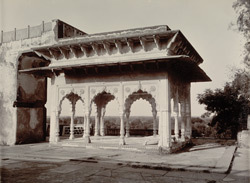 Photograph from the Curzon Collection of a baradari at Jawahur Burj in the Lohagarh Fort at Bharatpur, Rajasthan, taken by the studio of Priyalall & Company in c.1900. The fort was built in 1733 by the Jat king Suraj Mal (ruled 1733-63) and stands in the north-west corner of the walled city of Bharatpur. It had massive double ramparts made of mud and rubble reinforced by bastions, surrounded by a wide, deep moat. The Jawahur Burj or bastion was erected in the north-west corner of the fort in 1765 to commemorate the victory over the Mughals at Delhi of Jawahur Singh, Suraj Mal's eldest son and successor. This view shows the baradari on its summit, an open, columned pavilion with a double cornice and three arches on each side. There is a fine view from its elevated position, glimpsed here in the distance.